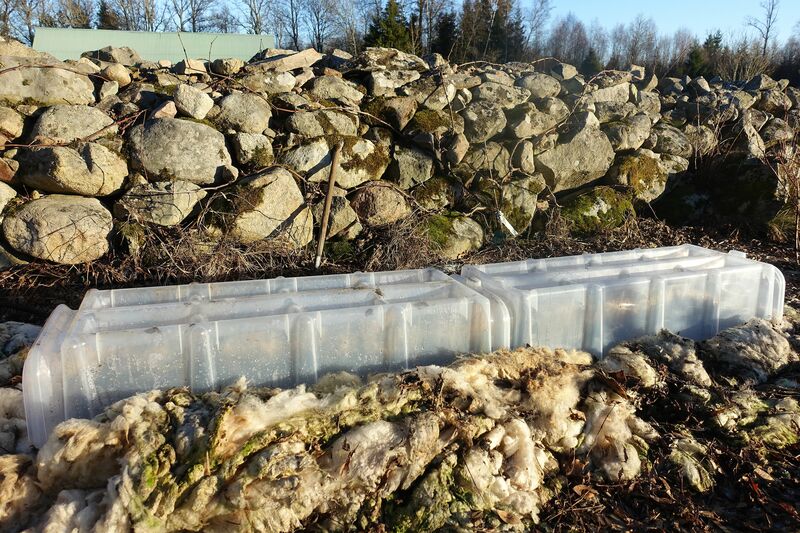 My spinach sowing is resting under the plastic boxes by the stone wall. I did a fun little spinach sowing this weekend. I have been completely over the moon because of the beautiful soil in my bed right now, which I covered with wool earlier. Many of the other beds are completely frozen now and very much at rest. But the soil in this bed has thawed and is full of life. So I decided to sow some spinach here! 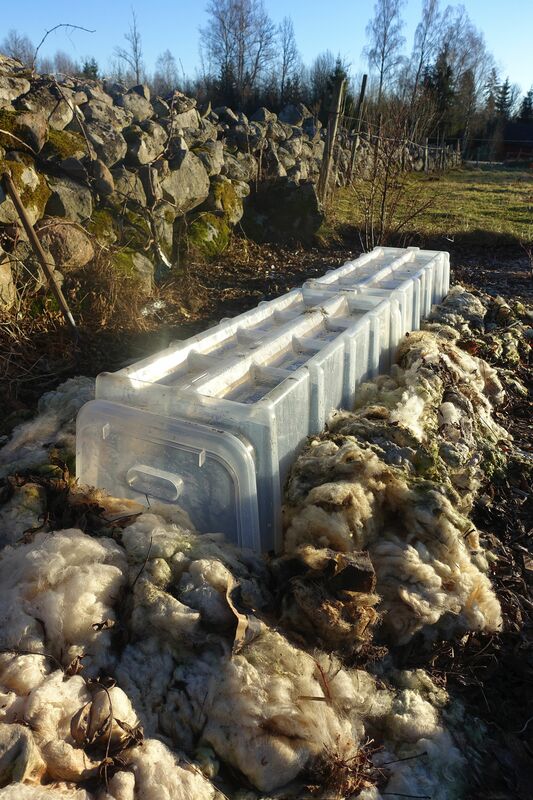 I put a layer of newspapers over the soil in this bed, and then a layer (around 4 inches thick) of sheep's wool on top. It's almost felted at this point, since it's been outside for about 6 months now. The reason why I chose this particular bed is because it's located in the best possible spot in my garden, especially when it comes to growing early in the season. It's protected against the wind, the sun reaches the bed during most of the day and I don't have any trees or buildings in the way. It's the perfect spot for a winter sowing! I have a miniature greenhouse here in my garden now and I wanted to try it out with this sowing. It's like a tiny polytunnel with separate parts that you can connect and assemble as you like. The plastic is hard and seems to be very durable. There are little depressions in the plastic on top, so that snow or rain can gather and drip down on the soil. I got the mini polytunnel from a French gardener and I'm excited to see if this might be a good tool for me to use in winter. I will let you know what I think of it later! This is what the bed looked like before I got started. 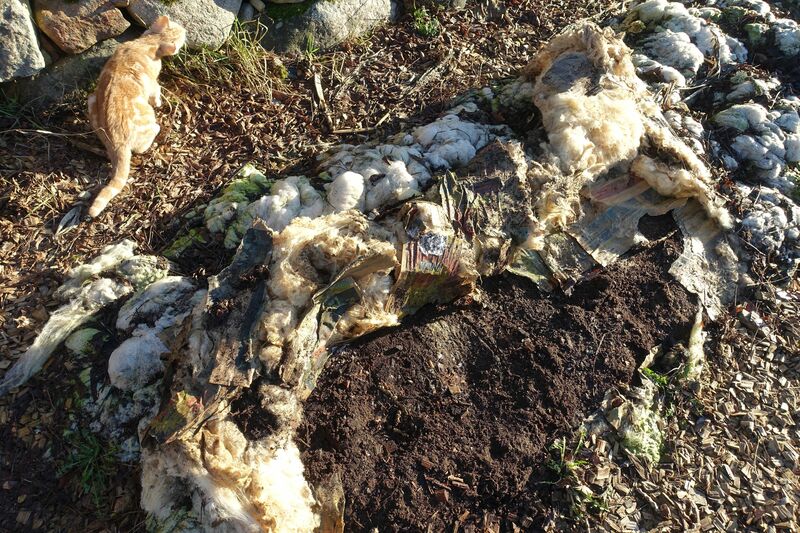 I moved the wool to the side, together with the half-decomposed newspapers. Then, I loosened the soil a bit and drew up two rows. 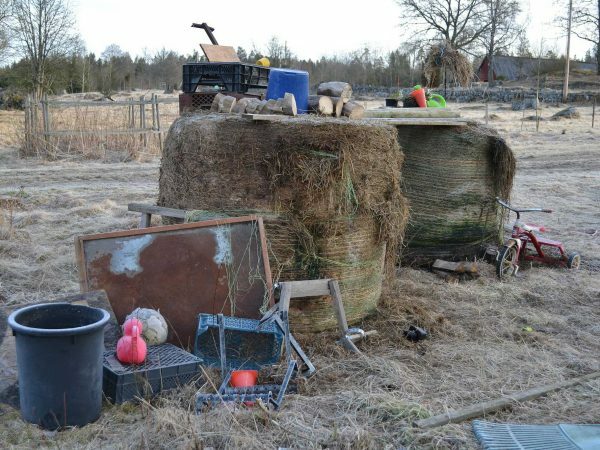 I hope they will be situated at the outer edges of the miniature polytunnel. I scattered the spinach seeds (of the variety Butterflay) in the rows. After that, I drew up another row in the middle and scattered seeds in there too. I raked some soil on top of the seeds and then I flattened the soil with my foot. I put two of the miniature greenhouses on top of my sowings and fastened them with a few earth anchors. After that, I pushed the wool back on top. 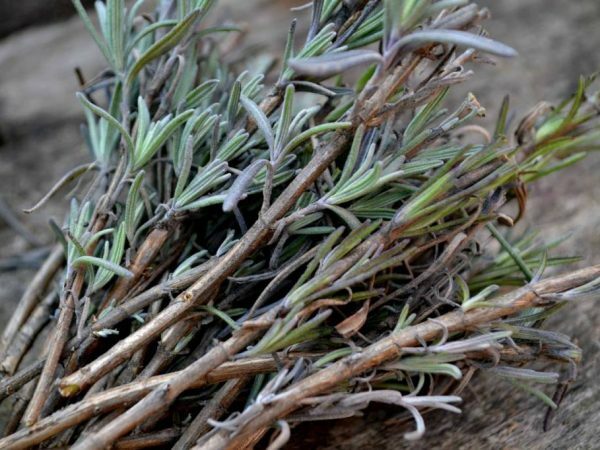 It will make great insulation along the edges of the miniature greenhouse. 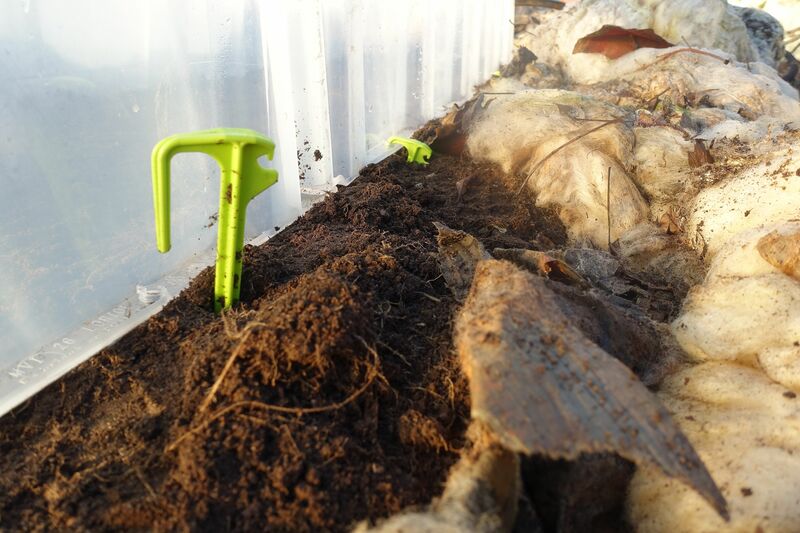 You can use the same principle for a pallet collar with a lid or a bed in your greenhouse, simply by putting a see-through plastic container face down over your sowings. 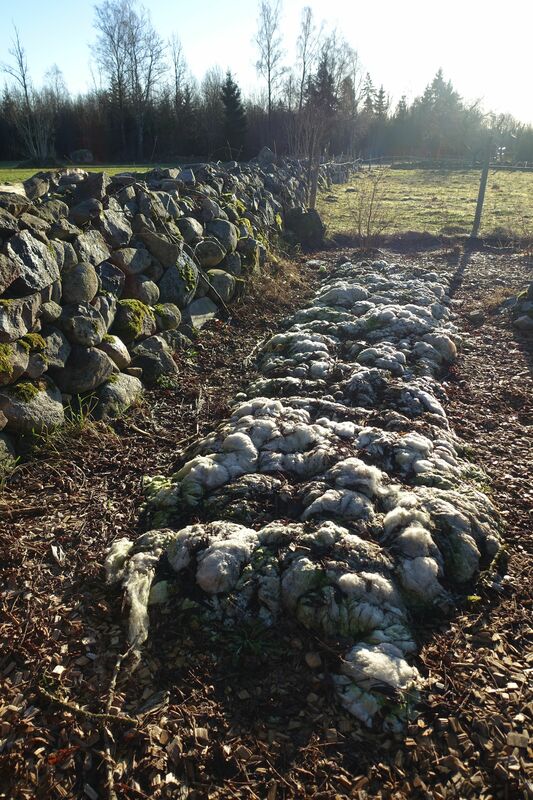 This is the first time I sow or plant a bed that has been mulched with wool. I only mulched this bed with old plant parts last summer. It was a fun experiment! The wool is actually really easy to work with, all I need to do is to push it away to reach the soil. This method is really promising, I'm looking forward to sowing spinach here next year! The soil has thawed under the layer of newspapers and wool and plenty of earth worms, centipedes and other bugs are crawling around. This part of the garden gets sunlight even in winter, which is a must for sowing spinach. After sowing spinach (three rows) I put the miniature greenhouses on top of the soil. 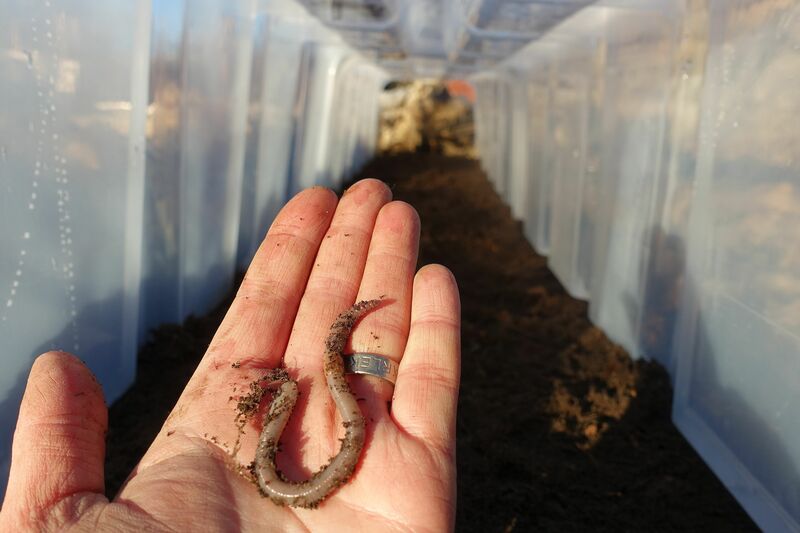 And look what I found in the soil, earthworms! The miniature polytunnel is fastened with little earth anchors. The structure is surprisingly stable! 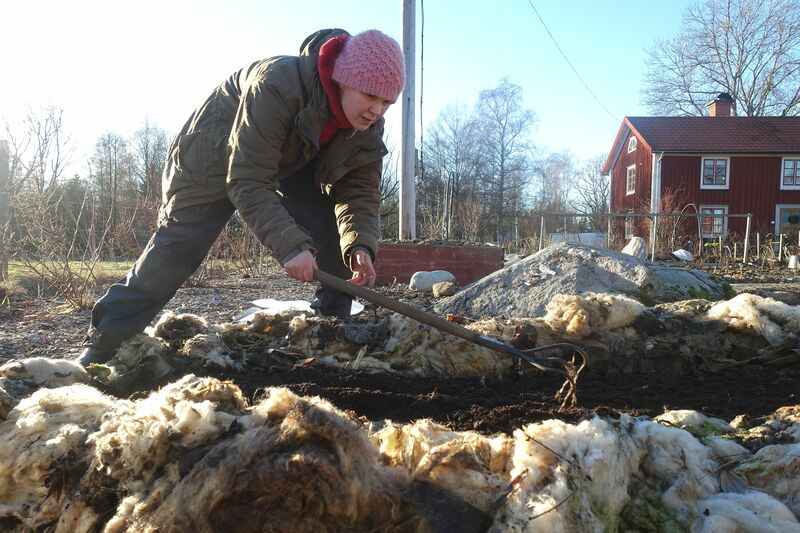 When I did the sowing, the temperature in the other beds was around 33-34 degrees (0-1 degrees Celsius) and around 35-38 degrees (2-3 degrees Celsius) in the wool-covered bed. I'm going to measure the temperature inside of the miniature greenhouse too one day. It will probably be a lot warmer in there than in the soil around it. Spinach seeds will germinate in low temperatures and the plants are very cold-resistant too. 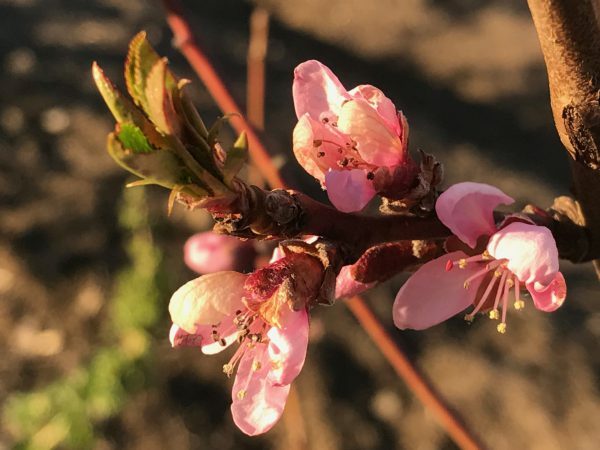 If the winter is mild, I think that the seeds will germinate within a few weeks and then you can start harvesting in March-April. If it's colder, they might germinate in March and be ready for harvest in April-May (this in zone 3). Done! Here, I have around 20 ft (6 meters) of spinach in my soil. Now, I'm just waiting for the seeds to grow. Spinach is a great vegetable to sow in winter, if you want to try growing something even if it's cold outside. If you get good results sowing spinach this time of year, you could always freeze some of your harvest. You can't freeze all leafy greens successfully, but spinach actually works really well! Good luck!